I decided a random post would be a good way to catch up on my life lately. – A while back, I was offered some extra work and I thought "Cool, I could use the extra money!" Then I was offered more work and I thought "Cool, I will be extremely busy for a while but I could use the extra money!" You can probably see where this is going. – I now have barely enough time to eat and sleep. Somewhere I’ve got to squeeze in some time for a plumber to come by to fix my sink and take my car in for servicing. Luckily some of this is temporary, so only a few more weeks to go. 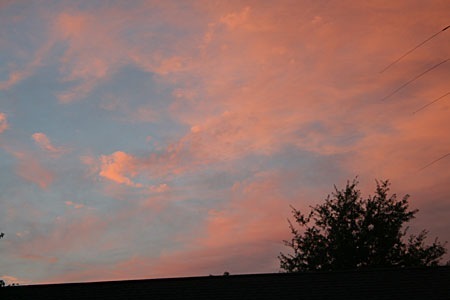 – While we’ve had a lot of rain lately, in between the downpours we had a few beautiful sunsets. – I’m probably the last person to find this, but I love many of these knit patterns at Coco Knits. Course this would require actual knitting time if I were to purchase one. One of those airy knit tops would be a good project for summer evening wear. – I’m fascinated by these crazy bookshelves, even though they’re probably not so practical for my volume of books. The tree is my favorite. – For those with kids, there’s Sh*t My Kids Ruined (without the *) and for those with pets, there’s Sh*t My Pets Ruined (also without the *). – Those bird eggs you find in the middle of the yard where there are no trees around, where do they come from? 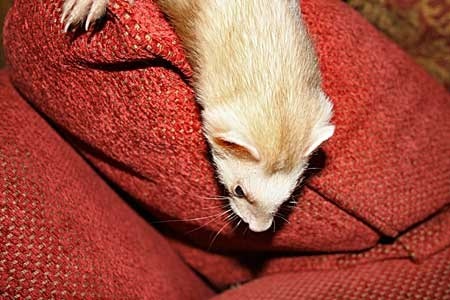 – I probably don’t want to know what the ferrets are doing when I’m not looking. Hope things settle down soon for you! I always figure that some creatures have been playing an egg-rolling game. I hope your work load lightens up soon! Those web sites are hysterical! I found the kid site the other day but haven’t seen the pet one before. I know! I can so identify with them! Got to check out the pet site! I think we could really relate! Love those bookshelves, you are right very impracitcal if you live in a small space and actually need shelves to help clear up clutter and stuff. Ugh for the work, yay for th emoney, but hopefully you’ll find time to eat and sleep soon. no doubt the ferrets are just simply waiting patiently for your attention. Because they are ferret angels, yes? Oh and Coco Knits – Very nice, I hadn’t ever seen those so you are not the last. Here’s hoping you have some free time soon to enjoy your newfound wealth. 🙂 More yarn or art supplies?? I loved the pet site, and forwarded it to my husband! While we have to live rugless with our cat who likes to use them as a litter box, she has never ever ruined anything, nor have my other cats. I guess I have to be thankful for small favors, right? Seeing that new sofa torn to shreds must have been so heartbreaking to the dog owner. Jim says Mittens is a stealth kitty. We blame a lot of stuff on Socks that is probably Mittens’ fault, but since we know Socks is a trouble maker, he is the one that gets in trouble. Hope your work load decreases soon, but it is always nice to have the extra money. Sorry you’ve been away, glad that you’ve been away making $$. The bird eggs, are they broken shells or whole eggs? If they are broken, the clever bird is taking them away from the nest after the chick hatched and dropping them somewhere else. This prevents predators from guessing where the nest is by looking above the shells. If they are whole eggs, that means some cowbird fledgling has pushed his rival host bird eggs out of the nest. Bad cowbird!